February 16, 2011 — Vertical dances, ranging from the mysterious to the humorous, will be featured in the University of Wyoming Department of Theatre and Dance performance March 1-6, in the Fine Arts Center studio theatre. "Boxed Set" will be performed at 7:30 p.m. March 1-March 5 and also at 2 p.m. March 5-6. Tickets cost $14 for general admission, $11 for senior citizens and $7 for students. For tickets and information call (307) 766-6666 or go online at www.uwyo.edu/FINEARTS/ . Patrons are urged to obtain tickets soon because of the studio theatre's small seating capacity. Choreographed by dance faculty member Margaret Wilson and geology Professor Neil Humphrey, "Boxed Set," explores the vertical and horizontal dimensions and how perceptions of dance are altered by the spaces in which it takes place. They describe vertical dance as a distinctive blend of modern dance and rappelling that allows free-flowing aerial movement. The performance developed from a piece that Wilson and Humphrey choreographed three years ago when the dancers were moving above and around small boxes in the studio theatre. They have since expanded that idea into a full evening's work, capitalizing on the uniqueness of the studio theatre for viewing dance in the round. "We have created a world made of boxes and squares," says Humphrey, who designed and implemented all the rigging for the performance. "We explore different ways to move within, without and through the boxes." An ensemble of 22 dancers comprises the performance. Performers dance on the ground, in the air and on the walls and ceiling. Using rope and harness, pulleys and ascending and descending devices, the dancers use all the available space in the theatre, including above the audience's heads. "Vertical dance is a unique aspect of the dance at UW," notes Wilson. "We have had the opportunity to present vertical dance outside at Vedauwoo in the summer and to integrate it into faculty concerts indoors, but this is the first time we have designed a full concert with vertical dance on campus." 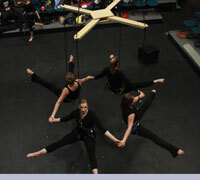 To learn more about the Department of Theatre and Dance, go to the website at www.uwyo.edu/thd/.